I made this silly little game as a test bed for the framework and toolset I'm currently writing. Most of the game's artwork is based on free resources from the Internet. Assemble animals by pushing parts from the middle into one of four boxes. Four parts make one animal. Stay within the time limit and don't push parts in occupied spaces. You can create hybrid animals, but purebreds score bonus points. Clearing all four boxes grants an extra life. 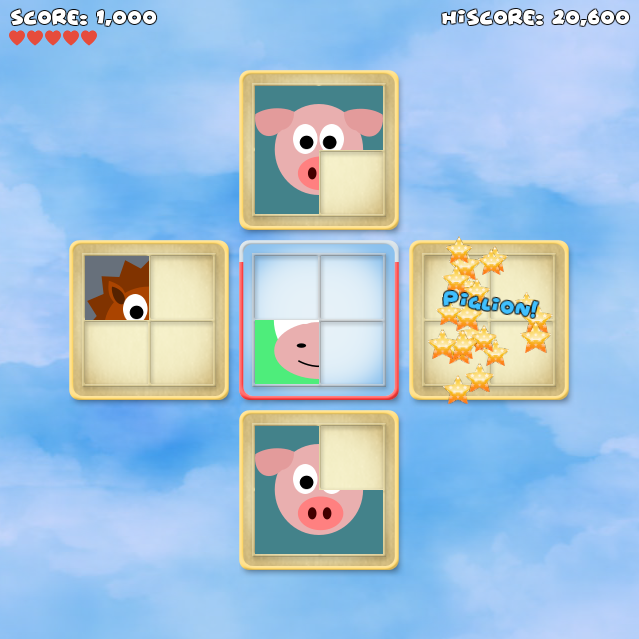 Use arrow keys/WASD, or click on the 4 outer boxes to push animal parts. Playing using keyboard keys is recommended. Requires LÖVE 0.10.2 (0.4) or 11.1 (0.4.1). Tested on Linux and Windows. Last edited by grump on Thu Apr 19, 2018 1:10 pm, edited 5 times in total. I needed some time to understand the principe first but after I understanded it it was really fun to play this! The button animations and the main menu looked and worked really good! Also nice that the highscore is saved. But unfornately the Desktop Fullscreen is very useless because the game is still in the same size then. But anyways keep the good work up! Thank you, LuckyChicken. The window should not be resizable, that's a bug. The 1:1 aspect ratio of the game would make maximized and fullscreen mode really awkward, with lots of empty space at the sides. I'm happy to hear you had fun playing! The, same didn't realize how to play at first, very nice game, I played non-strip on it for at least one hour . Nice picture, nice music, and really stressing when at high speed . Thanks for the feedback. I uploaded an updated version with bugfixes, slightly edited graphics and a new How To Play screen. Very nice little game with a simple but somehow unique mechanic (well at least to me). If I were you, I'd try to find ideas how to add value/goals but try to not add complexity (the simplicity in the mechanic is, IMO, really good) and release it on mobiles. It's a perfect fit for tiny 5minute game sessions. It's good game. But the code is... worst. It's impossible to understand it. Is it OpenSource anyway? I'm curious about the code obfuscation, did you use some public tool?